Jaylin Moore, a key contributor to Ford’s 2011 Division 2 City Championship appearance, has had to battle through early season injuries to prove he is a elite defensive back in the city. In this interview, he describes how his season has come so far and what he must improve on to get to the next level. King and Douglass should be tied right now for second place the PSL East. But King suffered a mis-hap in forfeiting a game to Osborn, a game where they won by over 50 points. Putting that aside, this game will still be important in the clearing up the City Playoff Picture. 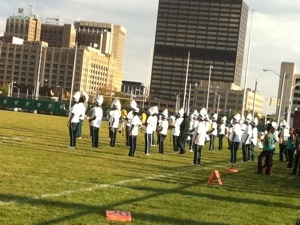 Douglass has been for the most part what I have expected of them this year. They are a run-first team, led by Demetrius Stinson who is an absolute stud at the Running Back Position. Fellow senior QB Kory Peterson has improved from his junior season, freeing up running-lanes for Stinson with his passing ability. King has a wide variety of playmakers to give the ball to. The Crusaders have about 4 different receivers they can give to ball to, most notably Mycial Allen and fellow senior James Alexander. The running game with King is no slouch either. Running backs Raymond Mitchell and Avonte Maddox are dangerous whenever they get their hands on the ball. 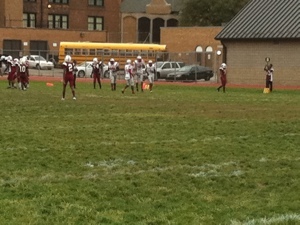 If Douglass has any chance in winning this game, they will have to win on the defensive side of the ball. King has scored 69 points in the last two weeks. King is playing at home and with a lot of momentum right now. I like the Crusaders in this game, and with this win they will gain the upper hand in the East Division. 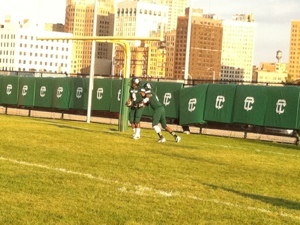 Cass Tech- The Technicians have lived up to the pre-season hype the surrounded them for the entire off-season. I have been impressed how the players and coaching staff have managed new uniforms, national rankings, and a tough non-conference schedule. Cass got off the a hot start this year beating Rice 25-18, followed by two easy wins before struggling in the first half against Cody. 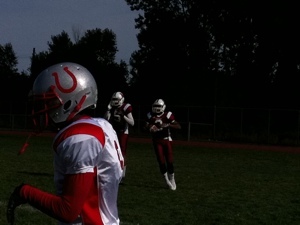 However, they stubbed their toe against Orchard Lake St. Marys this past friday and showed some weakness against the run. With that being said I have been impressed with the depth of this team. I was worried that having so many division one recruits would cause turmoil in the locker room. I couldn’t have been more wrong, transfers such as Joe Journey, Damon Webb and Dejuan Rogers have filled in nicely with all ready known players such as Jourdan Lewis and David Dawson. Cass has two winnable games coming up before the city playoffs so I expect them to be 6-1 and they will definitely be the team to beat in the playoffs. Cody- Coming into the season, I wondered who would be the team behind Cass in the PSL west division. Cody has surprised me this year. The Comets started off with a rough 35-0 loss to Detroit Catholic Central but rebounded nicely pulling of two convincing wins against Ford and Mumford respectively before running into Cass Tech. Cody hung in early, but Cass had just too much depth and over powered the Comets in the second half. Recently, Cody won a huge road game 12-6 over Renaissance. 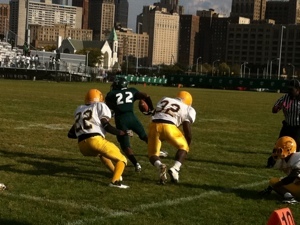 This win has certainly put them in position to make the city playoffs this year. Personnel wise, the Comets are led by dual threat Quarterback DeMarco Gulley, who as passed for almost 700 yards this season and has also eclipsed 400 yards rushing on the campaign. Gulley has loads of offensive talent to distribute the ball to, such as the multi-versatile Eddie Flucker and the always dangerous Kenyon Bell. 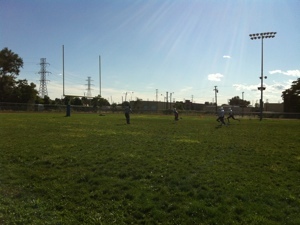 Running back Eli-Kevin Phillips has also emerged as a go to player on the Cody offense. Cody plays Western this week with a chance to clinch a city playoff berth. Ford- Ford had high expectations coming into the season, reaching last years Division 2 City Championship Game but only lost to Douglass. Ford has had to change the offense this year losing last years dual threat Quarterback Victor Edge. However, Ford has also returned last years playmakers Alonzo Bell and Jalin Moore both having the ability to play offense and defense. 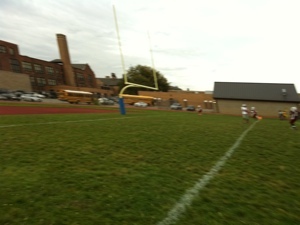 Ford started off the campaign with a disappointing loss to Pershing 12-0, and the following week lost 54-0 over Cody. The Trojans have won 2 out of the last three to possess a 2-3 record this season. Ford now has to win their 4 remaining games this season if they wish to qualify for the state playoff for the 2nd straight year. Renaissance- The Phoenix knew that coming into this season they would be a young team only carrying 9 seniors on the roster. Renaissance was looking to improve upon a previous season in which they made the city playoff and this year the Phoenix got off to a sluggish start opening the season with a tough loss to the always State Championship Contenders the Hawks of Farmington Hills Harrison. But rebounded nicely routing Western International 41-6. The following week, Renaissance was featured in the DPS Game of the Week, but this game did not look like a game that was supposed to be competitive, getting blanked 44-0 to Cass. The Phoenix won the following week setting up a monumental game in the PSL West division last weekend. 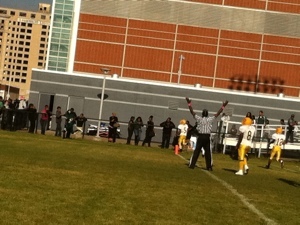 The Comets of Cody were victorious 12-6 in which they seemed to have clinched a city playoff berth. Renaissance will now have to win if they hope to make their State Playoff dreams a reality. Western- Western made a huge move in the off-season. Bringing in the well-known head coach Andre Harlan over from rival Southwestern to coach the team this year. Following Harlan across I-75 were a group of very talented players, especially a sophomore named Romello Ross who rushed for over 1,000 yards his freshmen season at Southwestern. 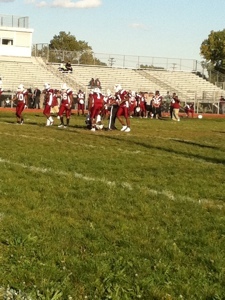 The Cowboys opened their new era at Garden City High School to play the Cougars. This game was a very close game in the first-half, both defenses were looked strong. But in the end Garden City was just too much to handle for the Cowboys. 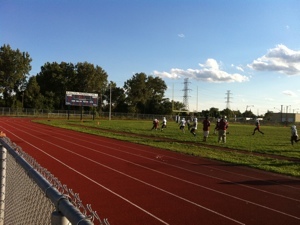 Western was than held to less than 10 points in two losses to U of D Jesuit and Renaissance respectively. However, the following weekend, Coach Harlan won his first game as a Cowboy Coach bettering Mumford 26-10. Romello Ross led the way rushing for 133 yards on 13 carries for the host Cowboys. This previous weekend, Western won a nail-biter in a game that came down to a two point conversion in which the Cowboys prevailed 20-18. The Cowboys are now faced with the daunting task over winning their 4 remaining games, including a game vs. Cody, if they wish to make the State Playoffs under their first year coach. Mumford- Coach Donshell English is no stranger to success in the PSL. English was the coach at Southeastern who with stand-out defensiv end William Gholston, who regularly made deep playoff runs. Coach English has had limited success this year with his Mustangs carrying a win-less record. Mumford has been held scoreless three times this year, most notably a 48-0 lost to Cody. English will ultimately get this program turned around. This is a relatively young team with some good talent. Look for Mumford to be a legitimate contender in the PSL with the next couple of years. Northwestern- First year coach Jimmy Hill knew that he must improve upon his offense coming into this season to be competitive this season in the PSL West this year. The previous season the Colts’ offense amassed less than 80 points. Hill has certainly improved that number this season as his Colts have scored more than 100 points this season, most notably a 62-0 beat down over Ford Academy for Creative Studies. The Colt must improve upon their defense not only for this year but for years to come. In the first two weeks alone, the Colts surrendered 87 points to Central and Cass. I know that Cass is stacked but they still put their back-ups in, a first team should be somewhat competitive with a second team. Northwestern certainly has the talent to contend in the PSL in years to follow. They play Mumford this week to try win two games this year. Which would equal the previous season with two wins. Dontae Clark, a junior wide-receiver and middle-line backer had 73 yards receiving against Detroit Northwestern. 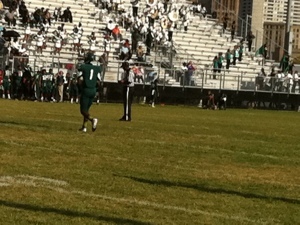 Romello Ross sprints into the end-zone for the first score of the day. 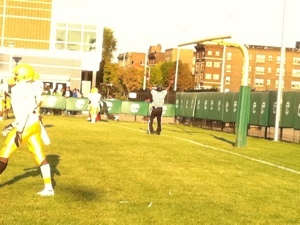 Romello Ross interceps a pass before half-time. 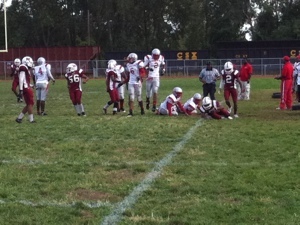 Northwestern celebrates their first touchdown on the day. Romell Ross accumulated 164 yards on 16 carries vs. the Colts. 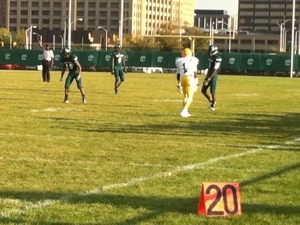 Dontae Clark sprints into the end-zone. 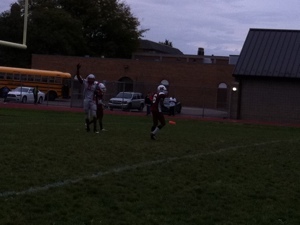 Malik Anderson picks of Western and takes it to the house. 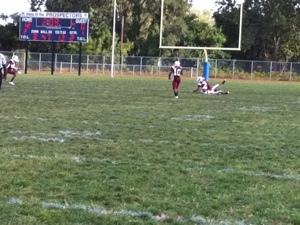 Colt tight-end James Reed dances in the end-zone to cut Western’s lead to 2. Don’t forget to check out my interviews with some of the city’s elite players. Just scroll down on the page a little and enjoy. The game of the week for this week will not take place in the city of Detroit this week, instead a game that will be played in Orchard Lake Michigan will be as the Division 1 and Division 3 State Champions battle it out in a mid-season non-conference game. 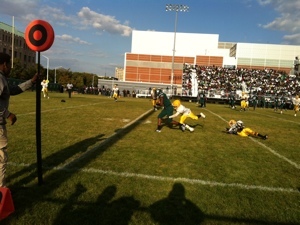 The Eaglets are coming off a complete dismantling of U of D Jesuit beating the Cubs 43-7 last week. 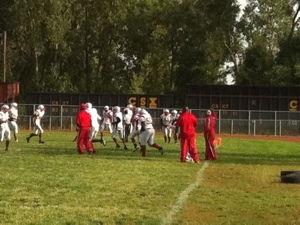 The Technicians look to keep their perfect season in-tact coming of a 46-20 win over the Cody Comets. 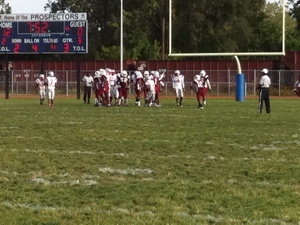 A key to victory for Cass in this game will be to stop the run game of St. Marys. The Eaglets have two running backs, Grant Niemiec and Parker McInnis, who are threats to score any time they touch the ball. Cass will also have to take advantage of their playmakers on the perimeter, especially the likes of Damon Webb and Jourdan Lewis. I like Cass in this game because of their athletic superiority at the playmaker position. 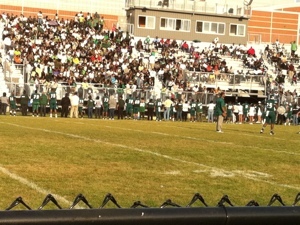 Could the number one team in the State of Michigan go down in this game? All will be revealed on a RED TURF this friday night. 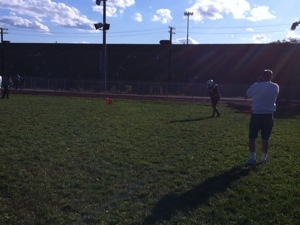 Farod Anderson takes a pass and walks into the end-zone. Western’s Dontae Clark picks off the Mumford quarterback and goes into the end-zone. Western intercepts a Mumford pass. Romello Ross tries to break away from the Mumford Defense.